Obviously one of the objects of our passion for catfish is the perfect catfish recipe. Eating catfish is maybe as much fun as catching catfish. 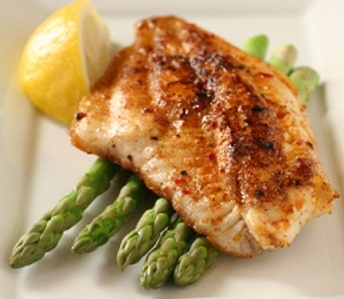 From a nutitional standpoint, catfish is extremely good for you as is any fish in your diet. What follows are some of our regional favorites, and even though we're headquartered in the upper Midwest, we've endeavored to include some recipes we discovered while catfishing in other parts of the country. Our recipe section will continually be modified. And if you would like to share one of your favorite ways to prepare catfish, submit it to us via our site feedback form. We'll include it and, of course, give you credit. 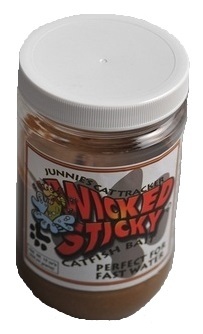 And don't forget to check our catalog for the new Junnie's Cat Tracker Coating Mix. This product will make you look like an expert chef. All the ingredients are combined in the box. Works wonderfully on wild game, chops and chicken. 1 Filet of Catfish (you cook as much as needed). Cover both sides with generous amount of dry cajun mix (available in most specialty stores) then place filet on sheet of foil. Place fish on foil on a medium hot grill and cook without turning for 7 minutes. Remove fish from foil and place directly on grill and cook on both sides until done to preference ( for me thats about 1-2 minutes each side). Place on serving dish and apply touch of cajun mix to add color and serve. ENJOY! Baste fish in whole milk for 10 minutes and then drop in paper bag with mixture of yellow corn meal and cajun mix. Fry fish in oil until light brown. Remove fish and place on charcoal grill turn fish until ready. I use this when preparing a large batch of fish . This gets all the fish to the table hot and at the same time and also burns off the excess oil. Cut filets into 1- 3 inch strips. Beat egg and buttermilk together. In large bowl mix cornmeal, salt and pepper to taste. In large pot add enough oil to cover filets and bring to boil, add Jalepenos to oil. Drop catfish strips in buttermilk and egg mixture, then place roll in cornmeal, repeat if you want extra crispy. Catfish is done when strips float and are golden brown. 2 (10 oz. each) boxes frozen sitr-fry japanese style vegetables and seasonings. Remove broiler pan from oven; line with foil. Set oven to broil. Bring teriyaki sauce to a boil in a large skillet. Remove from heat. Add fish fillets; turn to coat and let marinate 3 minutes. Arrange fillets in single layer in a broiler pan. Broil 3 or 4 inches from heat source 9 minutes, or until lightly browned. Discard remaining marinade and rinse skillet. Put vegetables, seasonings and oil in skillet. Cover and cook 4 to 5 minutes. Sprinkle fish with green onions. Broil 1 minute longer. Serve immediately with the vegetables and noodles. makes 4 servings. Sift and blend the flour, baking powder and salt in a bowl. Mix the tablespoon cooking oil, beer and tabasco sauce and add to the flour mixture, stirring until smooth. Chill the batter. Heat the peanut oil to 375 degrees. Dip the cold strips of fish in the cold batter and cook in the hot oil for about 4 minutes. keep each batch of fried fish warm in a 200 degree oven while the next batch is cooking. Allow the oil to return to 375 degrees before cooking more fish. Serve with cocktail or tartar sauce. Serves 4. Combine corn meal, flour, salt and paprika. Dip fish in corn meal mixture to coat. In skillet, heat oil. 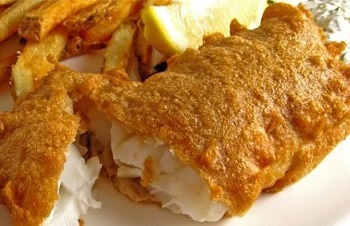 Fry fish fillets till brown on one side. Turn and fry the other side. Remove broiler pan from oven. Line with foil for easy cleaning. Set oven to broil. Arrange fish fillets and tomato slices on foil. Sprinkle with salt and pepper. Spread 1 tablespoon ranch dressing on each fillet. Sprinkle with Parmesan cheese. Dot tomatoes with butter. Broil 8 to 10 minutes. Just until fish are opaque in the center and top is brown. Makes 4 servings. 1 lb. catfish fillets, cut into 1 inch chunks. Heat oil in a 3-1/2 quart saucepan over high heat. Add onion, green pepper, celery, ham, garlic. Stir to mix. Cover, cook for 3 minutes, stirring once. Add remaining ingredients, except hot pepper sauce. Cover and cook over high heat 6 to 7 minutes, or until fish is barely opaque in the center. Remove from heat; let stand covered for 3 minutes until rice is tender. Stir in hot pepper sauce to taste. Makes 4 servings. Fish should be cut into 1-1/2 x 1-1/2 inch pieces. Drain well. Fill pint jars 1 inch from top. Add to each jar the ingredients listed above. Seal jars and process in pressure cooker for 1 hour and 40 minutes at 15 pounds pressure. The fish can be eaten as soon as the jars have cooled. Clean, wash and dry fish. Combine remaining ingredients, except cheese. Brush fish inside and out with sauce. Place fish in a well greased baking dish and bruch with remaining sauce; sprinkle with cheese. Let stand for 30 minutes. Bake in a moderate oven at 350 degrees for 30 minutes, or until fish flakes off when tested with a fork. Turn over to boil and place fish 3-inches from flame. Brown for 1 or 2 minutes. The fish should be skinless fillets cut into small pieces. Pack loosely in a quart jar. Add 5/8 cup salt. Fill with white vinegar. Place in refrigerator 5 days. Drain. Freshen in cool water 1/2 hour. Drain; put fish back in quart jar. Add scant cup of surgar, 1 teaspoon pickling spice and sliced onion placed between layers of fish. Fill jar with white vigegar. Shake often. Ready in a week.